Wonderla has recently repositioned its brand as a complete family entertainment destination with the tag line ‘Wonderla the place where you get closer and closer'. Overall footfalls were flat at the Kochi Park, an increase of 5% mainly due to park revamp and introduction of new rides and new marketing campaigns. The Bengaluru Park at the same time saw a slight decline by about 3% mainly due to higher ticket price set for Bengaluru. The company has maintained its target of accomplishing 8 lakhs footfalls in entire FY 2018. There has been a fall in group footfall in Hyderabad, Bangalore and Kochi. Company attributes the reason for this fall mainly to Pricing and to certain other factors such as macroeconomic conditions, school calendars. The company has completed acquisition of 57 acres of property in Chennai for a new amusement park in a place called Thiruporur roughly about 40 km from Chennai. This park is expected to be operational by FY2020. NPS indicates whether people are recommending the product or services to their friends, relatives etc. 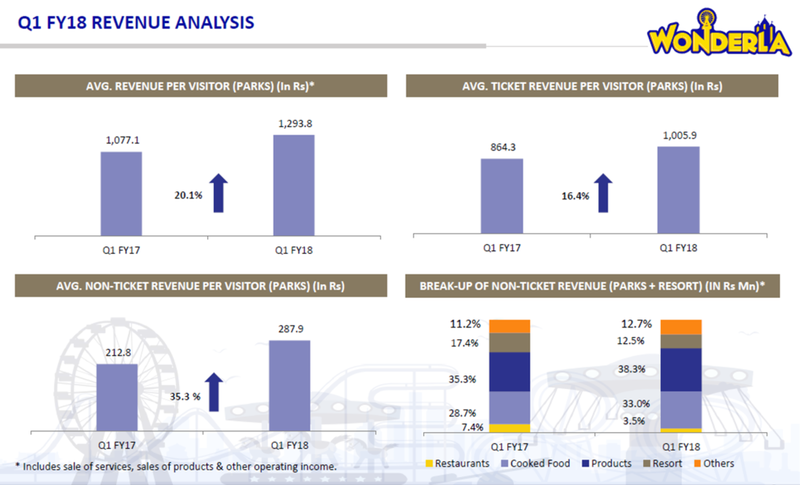 This high NPS surely implies that notwithstanding increase in ticket and non-ticket expenses, customers do find value for money spend for their experience at Wonderla. Revenue from operations grew by about 18.3% YoY to INR 102.3crore in Q1, FY 2018 as compared to Q1, FY 2017. EBITDA increased by 17.2% YoY to INR 43.6 crore in Q1, FY 2018. EBITDA margin marginally declined from 43.1% to 42.7%. The company's operating cost remained under check for this quarter. PAT has increased by 15.5% YoY to INR 25.9 crore in Q1, FY 2018 as compared to Q1, FY 2017. PAT margin marginally decreased from 26% in Q1, FY 2017 to 25.4% in Q1, FY 2018. Company generated a higher Cash PAT which increased by 14.6% YoY to INR 33.9 crore as company continued its focus on maintaining healthy operating cash flows. The GST for company is at 28%. Input tax credit is very minimal at 5%-6%. It is estimated that after Chennai plant, the debt requirement for newer projects would be minimum as Cash flows from the Chennai facility would bolster overall free cash flow. Wonderla expects that footfall will be flat or even marginally decline on account of price hike and it would try to find out ways to compensate for them through groups or business development channels. The company is bullish on Q2 as Dussehra holidays are going to start from September 22 this time which normally falls in October. From marketing footprints perspective, the company so far had been focusing only on Hyderabad and now it would be expanding its geographical reach across 200 km radius which is its normal area of cash net for any of the parks. Warangal and Karimnagar aare planned for this year's marketing expansion and it will be done by the business development team, which will bring in more people.